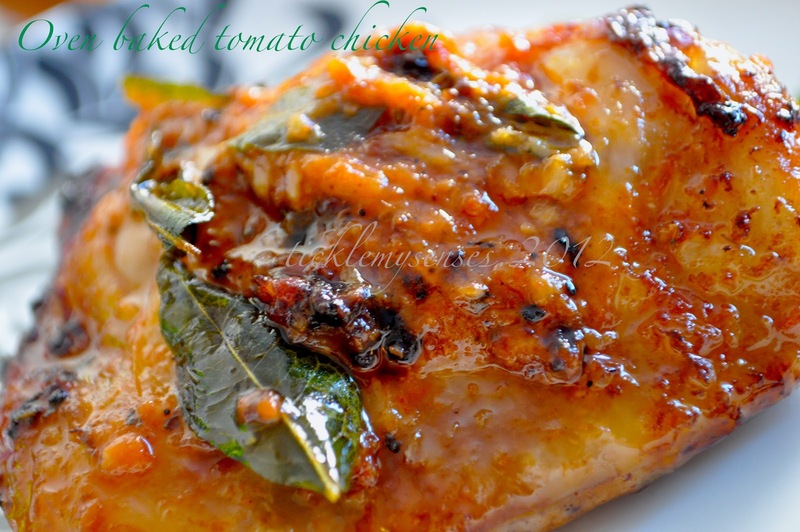 Tickle My Senses: Oven baked tomato chicken- for little tots. This is Baby A's favourite baked chicken dish. 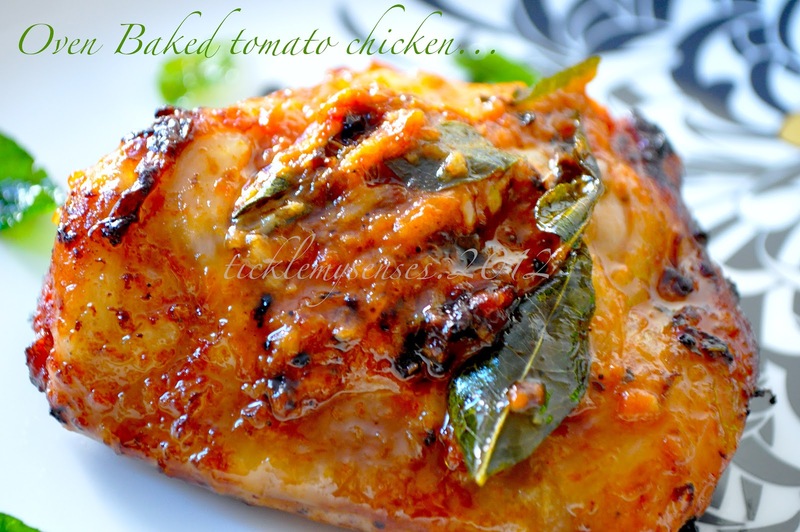 Its is tomatoey and tangy with a hint of flavour from the curry leaves and herbs. I usually double the recipe as Baby A happily ignores all the sides on his plate and just goes for the chicken. 1. Take the tomato concentrate, ginger-garlic paste, herb de provence into a bowl mix well to form a paste, add salt to taste. 2. Make deep slits/cuts into the thigh to allow marinade to penetrate meat, coat the chicken thigh well with marinade, making sure it enters the slits. Keep aside for an hour to marinade. 3. Place the marinaded chicken in a small baking dish along with all its marinading juices. 4. Preheat oven to 180C for 7 minutes. 5. Heat a small vessel, add oil, when hot add curry leaves, allow to crisp up, pour flavoured oil with curry leaves over the chicken. Place chicken in centre of oven and allow to cook for 20-25 minutes till completely cooked, turning once in between. *I prefer to cook the chicken with skin on for Baby A, as it keeps the meat really moist and juicy. However I do deskin it before serving it to him. This recipe looks yummy...will surely try it out for my daughter who does adores baked food.